Hell hath no fury. But it does have cinder blocks. Bobby Mackey's Music World is a nightclub in Wilder, Kentucky that is supposedly so haunted it has its own portal to Hell in the basement. Country singer Bobby Mackey bought a run-down building in 1978 and turned it into a nightclub. It wasn't very successful until Mackey heard that a murdered woman's body was dumped in the nearby town of Fort Thomas more than 100 years ago. Since paranormal aficionados consider any murder, even one located 3 miles away, to be sufficient proof of a haunting, the club was soon being promoted as "the most haunted nightclub in the USA". 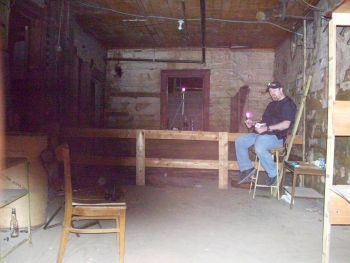 The building allegedly housed a meat-packing facility and slaughterhouse in the 1850s; however, why there would be some connection between meat packing and the presence of ghosts and demons is anybody's guess. The owners promote a number of popular but completely unverifiable stories, including one about a dance hall girl named Johanna who committed suicide in the basement after a tragic love affair, gunfights between Cincinnati mobsters in the parking lot, and secret satanic rituals held in the basement by cult members. "The spookiest thing about this place is how little gin they can put in their drinks and still call it a gin and tonic"
"I'm not sure what's more scary: the paranormal or fat women in tank tops and tube tops riding the bull"
"Hey, if you're scared of ghosts, no worries, the smoke disguises them"
They may not be able to keep the restrooms clean, but one thing they are very good at is publicity. Bobby Mackey's was launched onto the tabloid TV scene in the early 1990s with a supposed live exorcism of the club's caretaker performed on that most credible of documentary programs, The Jerry Springer Show. More recently, it's received the highly imaginative attention of shows like Ghost Hunters, Ghost Adventures, and A Haunting.